G.Skill, known for its high end and stable memory products has now announced the availability of a 32GB DDRR 1333 MHz laptop memory kit that have been designed especially for 2011 variants of the Apple iMac. The kit consists of 4 hand picked 8GB DDR3 memory sticks that have thoroughly passed G.Skill’s rigorous memory related tests before being packed and shipped to resellers. These kits have been designed more of for working in professional graphics editing studios, audio and video editing and as well as other professional applications that may be used. April 5th 2012. 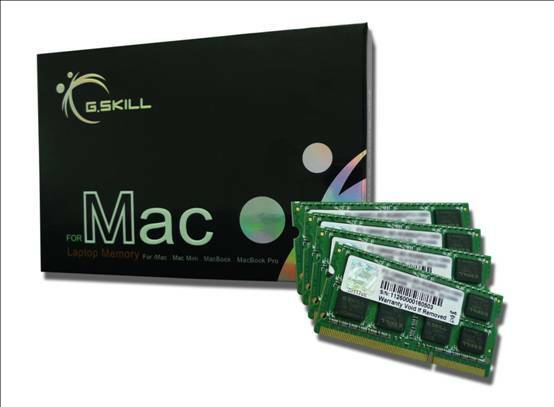 G.SKILL, the worldwide leading high performance memory designer, has released the 32GB DDR3 1333MHz laptop memory kit for Apple iMac 2011. The G.SKILL 32GB Mac laptop memory kit, consists of 4 matched 8GB DDR3 sticks, has passed G.SKILL’s rigorous compatibility and reliability tests with the latest Apple iMac 2011 machines for guaranteed performance. Taking the full advantage of 4 memory slots on iMac 2011 machines, G.SKILL 32GB Mac memory kit is the best-in-class memory solution for Professional graphic, video and audio editing and other professional applications. The new 32GB memory kit for Apple iMac 2011 is available now through G.Skill’s authorized distributors and resellers worldwide. For detailed product specification and compatibility information, please visit G.SKILL website. G.SKILL Is Doing A Giveaway; Join Now!